Welcome to SNT at our NEW location in Fenton, Michigan. We moved here April 27th and opened on May 1st, 2007 and as of today, May 25th, have just about everything in place just the way we want it to be! When you first walk in, you'll be coming into our framing vestibule. 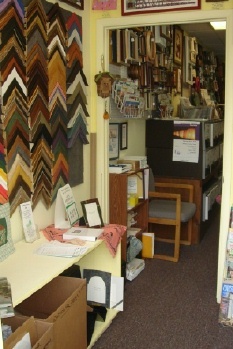 You did know we did custom framing, right? The newest stitching magazines will be here as well as our Mosey N Me handcrafted Uncle Sam standup welcoming all stitchers. The checkout counter is immediately to your right. I tried to put unusual stitched models on display in the vestibule ... miniature 40ct Silk Gauze pieces, Knotwork and Punch Needle, as well as Monsterbubble's "Welcome" which is stitched on an actual screen and framed! There is also a fun model from Calico Crossroads that states "Organized People Are Just Too Lazy To Look For Things". 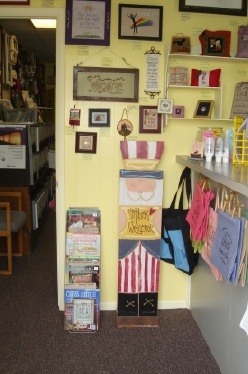 Here you are, glancing across the built in checkout counter into the main room of the shop. 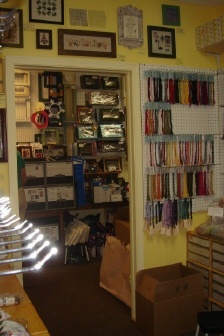 This is the largest room where the cutting/framing table is located, our fabric section, and the majority of our beads and charms, kits and prefinished items. As you pass through the doorway, you'll immediately see our 'chart section' ahead of you on the left ... well, maybe not the charts right off, but you'll see the boxes the charts are stored in anyway. We have 21 boxes filled with all your favorites! Each Drawer Box is labeled by 'category' ... for example, Cats, Big Cats, Dogs, Wolves are in one drawer; Angels, Noah's Ark, Inspirational, and Hardanger are found in another drawer; Halloween and Thanksgiving are in another. When you pull a drawer out, you can pull it easily to aprox. 1/2 way and it will stay in place while you browse. Each Category is marked by a card in bright bright colors with the name of that category on it. Then, each chart in that category is filed in order by Designer name with it's own card marking each ... makes it very easy to find what you're looking for! And if you don't find it, we now have a computer section where you can sit and browse .. or have us do that for you! Now, turn to your right. This is where you'll find everything that's NEW. 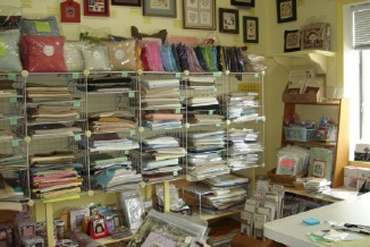 Charts in the racks ... large and small; kits; fabrics; whatever .... if it's NEW, it will be here ... and this area will change monthly as we get each new shipment in. 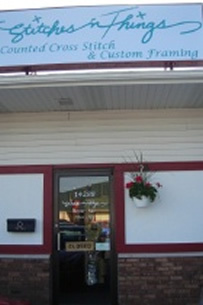 I know this will be your 1st stop when you visit the shop! 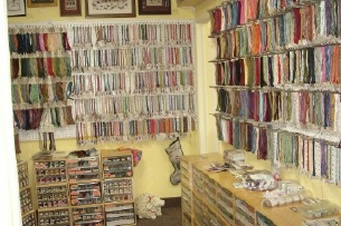 As you look at the NEW items, and then find yourself glancing to your left ... you're looking into our largest room ... where all the fabric and prefinished and majority of the kits are kept. 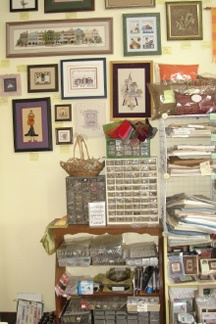 Also all the Mill Hill beads, buttons and Treasures, and our huge collection of charms and beaded embellishments. 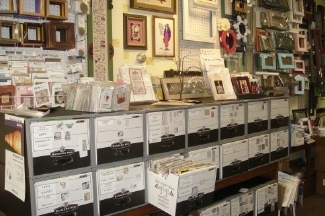 Our fabrics are stored in cube units ... with each cube labeled by Count and Type of Fabric. Individually bagged, you will quickly be able to see (as will we!) 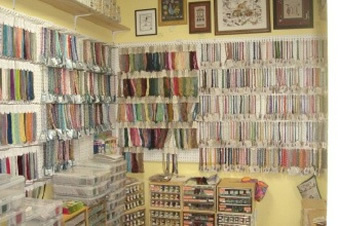 the colors in stock, as well as the variety from 7ct to 40ct. You're more than welcome to look through the fabrics yourself to find the color you're searching for, or to match your fibers up to. We try to custom cut your fabric for you whenever we're able, and each smaller cut piece is then labeled with size and price and put back into the bag with the rest of the yardage. Above the fabric cubes you'll find quite the assortment of premade pillows from Trail Creek Farm, JBW Designs, and Stitch A Gift. The Curio Cabinet holds our scissors, beaded fobs, teeny stitched models, and anything else that's small and fun! As you look to the right of the Cabinet, you'll see one of our two entrances to our Room Of Fibers. With the 1st picture here at left, you've just entered "Nirvana" and are looking back out the 2nd entrance .. where you can see some of the Book Bins and part of our frame selection. The middle picture is standing at the 2nd entrance looking at the doorway you've just come through. And, picture 3 at right is the other side of this cool fiber area.. 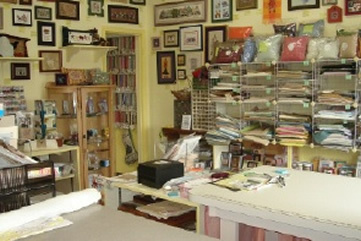 When you leave the Fiber Room through that 2nd entrance, you'll turn to your left and see a little 'jutty out wall' where the Caron Watercolours, Wildflowers and other assorted silk fibers are on display, as well as our huge selection of NeedlePunch designs stored in another large 2-drawer file cabinet. 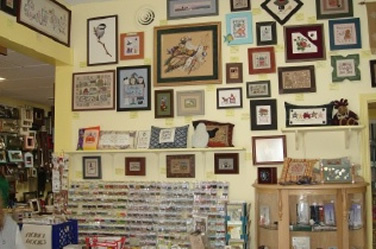 As you walk around that 'jutty out wall' (with the frames and scroll rods on display on your left), you will see the remainder of our Punch Needle accessories and hand-dyed Weavers cloth fabrics (and our Q-Snaps too). And ... this is where our new Customer Computer area is. If you're looking for a particular design and don't find it in our selection, we are more than happy to let you look for it (or we'll do the searching for you!) on-line at our different distributor and designer links. As you sit at the Computer and look straight ahead .. this room is the 'inner sanctum' .. the computer room and office area. (we have a gargoyle sign that says "Abandon All Hope Ye Who Enter Here" that hangs above the wide doorway entrance. Debbie sits at the first computer .. this is where your e-mails are answered and your catalog orders are processed. 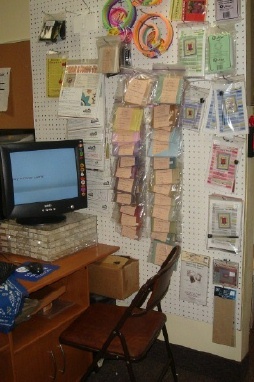 The area directly behind her chair are our Order Bins where your orders/requests are attached to a bag and then filed in alphabetical order. The items you've ordered are put into your bag and the order form is marked with a high lighter so we can see at a glance if your order is still waiting for another item(s) to arrive. If still awaiting, your order bag is then filed in the bins, and as the missing items arrive back in the shop, they're added to it. I sit at the very last desk when I'm not running around the shop and place orders with my distributors/designers so your orders can be filled as quickly as possible. This is where I do all the bill paying work too. I have a framed calligraphy sitting on my desk that Betsy Stinner of Earth Threads gave to me ... it says "I Am Not Granting An Audience Today". The area behind my desk has file cabinets and more stuff in storage boxes ... like class projects, kit materials, donated items for our Camp Stitchalot Stitching Retreats, etc. The models on the wall in this room are, for the most part, favorites of mine that aren't current enough to be on display in the main areas and probably should be taken down but I'm not ready to stop looking at them yet. 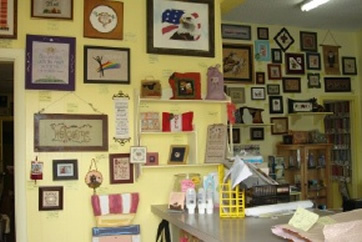 Mostly all are Mosey N Me stitched designs! 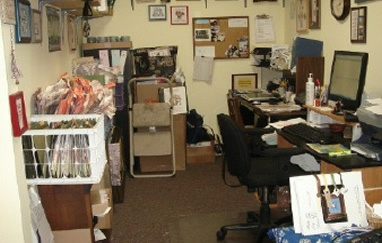 Once your order has been filled - with everything highlighted - and is ready to be processed through, it goes to the Shipping Room (shown here at right). Here, your order is packaged, weighed, and then taken back to Debbie's computer where we get the USPS shipping cost as determined by postal weight. 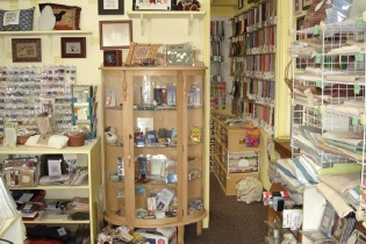 Once we know how much the cost is to mail it to you, your order is taken back up to the front room where the register is ... at that check out counter you passed on your way into the shop. Once we've rung your order through, it's sealed and taken back to the shipping room to be placed in a postal bin to await the next morning's mail run to the post office. 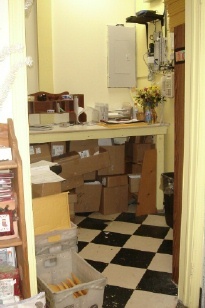 Looking at the picture of the shipping room, just the the left of 'that' doorway is our little 'tunnel of a restroom'. We have stitched models on the walls there too, as well as a 3-square Anne cloth stitched design from Dutch Treat that serves as a toilet tank cover/decoration! We even have one of her Table Toppers in there ontop of the vanity/storage cabinet! We hope you've enjoyed your visit - as I get newer images, I'll post them here for your virtual tour. 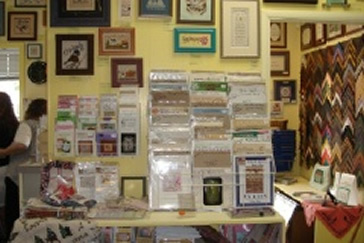 If you're in the area, I really hope you come see the shop in person, because after all ... Stitches N Things is where YOU count!